The doors opened at 10 AM, 1 PM, and 7 PM for shows starting an hour later under “six colossal tents.” The cost of admission was 50 cents, with children under 9 at half price. 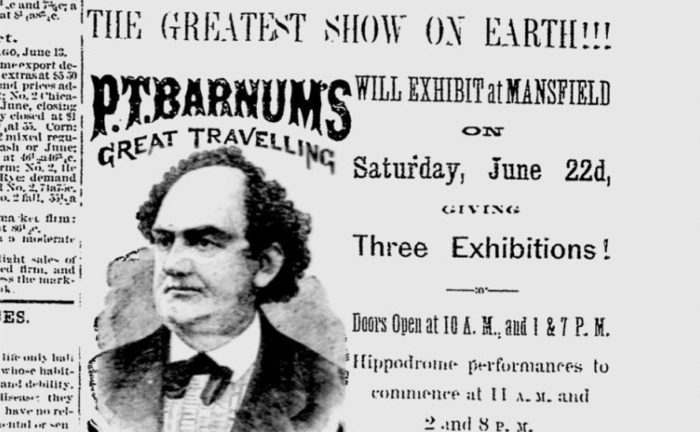 Note that the ever-promoting Barnum offered free admission for anyone who bought his autobiography, a massive work with 900 pages and 32 full-page engravings. The cost of the book was $1.50 (allegedly marked down from the original $3.50 price). The advertisement for the Mansfield show that appeared earlier in June in the Richland Shield and Banner included the following (this is just a part, mind you): Please note that these words are used in the ad, not ours! The only living group of monster sea lions on exhibition, kept in massive water tanks. The wonderful African snake charmer. Magnificent representative specimen of rare living wild animals, birds, fishes, insects, reptiles, and Marine Monsters. Hippodrome & Circus which is strictly moral and high-toned. Great Double Ring in the Grand Entrée Pageant. One hundred performing equestrians, acrobats, gymnasts, knights, Turks, Tartars, Greeks and Ladies in Medieval costumes, representing a scene of royal magnificence never before witnessed. The shows appear to have been very well received. The next published Richland Shield & Banner stated that “never was there such a crowd of people in Mansfield.” 15,000 attended the shows, the article claimed, and streets were crowded from 6 AM on. At 9 AM, a grand procession of “bedecked in gold, silver and flaming colors, camels, elephants, men and women representing oriental times and styles, with a gold figure-headed wagon, palace cars, and scene-painted wagons drawn by horses covered with beautifully ornamented blankets” made its way through downtown. The Mansfield stop took place between shows in Massillon and Mount Vernon. The 1872 Barnum Tour is considered the beginning of the “Golden Age” of the circus in America, and was made possible when Barnum was coaxed our of retirement. 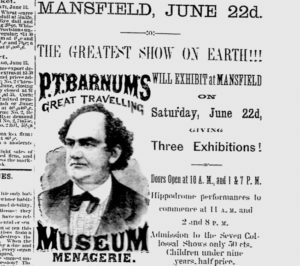 Mansfield continued to be a stop for the Barnum Circus for another several decades.